For 22 years, Wine Over Water has been taking place on the Walnut Street Bridge. The event has always been a wine and food tasting hosted by and benefitting Cornerstones, Inc. 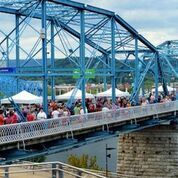 Taking place Oct. 5-8, this year marks the addition of multiple events that will take place off the bridge making the shift to a multi-day food and beverage festival highlighting Chattanooga’s culinary scene. 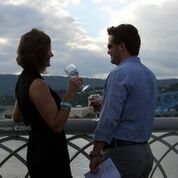 The main event, Wine Over Water, will take place on Saturday, Oct. 7, is presented by title sponsor Atlantic Capital, and will incorporate hundreds of wines as well as local food and music while celebrating passion for history and preservation of Chattanooga. The festival will start with a five-course wine dinner at St. John’s on Thursday, Oct. 5, and wrap up with a yoga brunch on Sunday, Oct. 8, with other events in between. Tickets to all events can be purchased at wineoverwater.org and range in price from $75 - $150. Also new this year is a designated driver ticket to the Wine Over Water event. Tickets are available for $35 to those who wish to attend the wine tasting but not take part in the actual tasting of wine. Instead, ticket bearers will receive a free WOW T-shirt, be able to drink complimentary kombucha from The Local Juicery, still enjoy all the food available for purchase and the samples at no charge, and have a blast with their friends on the bridge. Thursday, Oct. 5, 6:30 p.m. Kick off the WOW weekend and enjoy a five course dinner prepared and paired by Executive Chef Rebecca Barron and Sommelier Michelle Richards. Guests from around the world come to take pleasure in the quality, ambiance, and attention to detail St. John's offers. Friday, Oct. 6, 5-9 p.m. Hop between Chattanooga Smoke House, Barley, Bitter Alibi, Oddstory Brewing Company, 2 Sons Kitchen, and Hutton & Smith for special beer and food offerings. Brewery tours at Oddstory will be offered every hour. Friday, Oct. 6, 5:30-8 p.m. The exclusive Best Cellars premium wine tasting event will be held at the Chattanoogan Hotel with more than 150 different premium wines as well as a silent auction and live jazz from Dr. B and the Ease. Friday, Oct. 6, 7:30-9:30 p.m.
Keep the party going and the champagne flowing. Featuring exclusive champagnes from Edmund Amoye of Veuve Clicquot and heavy hors d’oeuvres by James Beard Semifinalist Chef Erik Niel, this festive party will keep everyone’s spirits up after the wine goes down at Best Cellars. Hop on the trolley to learn more about Chattanooga’s historic architectural history before strolling the bridge at Wine Over Water. Saturday, Oct. 7, 5-8 p.m. Hundreds of wines, more than a dozen local restaurants, and live music will fill the bridge on a beautiful fall evening over the Tennessee River. Full listing of participating restaurants and musicians is below. Sunday, Oct. 8, 10 a.m.-12 p.m. The perfect cure to a libations-filled weekend is a yoga class - with more libations! Join Veuve Clicquot and Lululemon for a yoga class taught by Lululemon Ambassador Kyle House accompanied with beats from DJ Krystlz, for a Sunday Funday filled with bending, bubbles, and a delicious brunch from Chef Charlie Loomis of Feed with support from Springer Mountain Farms and Trent Brockie from The Local Juicery. Publix will provide complimentary samples of charcuterie and Bluff View Bakery will provide complimentary bread. More information can also be found on the Wine Over Water website, Instagram, and Facebook page.